When I visited the John Muir Trust centre in Pitlochry earlier this year to discuss my exhibition there in May / June 2015, I was asked whether I might include some paintings of that region. In the past I’d walked and created paintings of Ben Vrackie, Beinn a’ Ghlo and the Drumochter Hills but I’d always fancied heading a little further east and north to explore beyond Glen Shee. 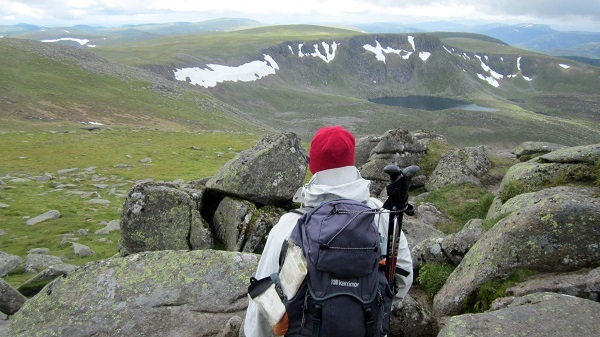 If ever I needed one, this seemed the perfect excuse to do some walking around Lochnagar and the White Mounth ….with the hope that I would get some interesting ideas for paintings. The main reason we’d not been to this area before is that it is just a little too far away from Irvine. We would need to stay over night somewhere in order to walk any of the hills here. When we were a little younger and sprightlier, Nita and I would take my old light weight Saunders tent and camp and walk ….but we gave that up a good few years ago. Indeed, the last such outing was back in 1999 not long after we’d moved to Scotland and we spent a few days out on the Isle of Jura and after that the wee tent was put into retirement! 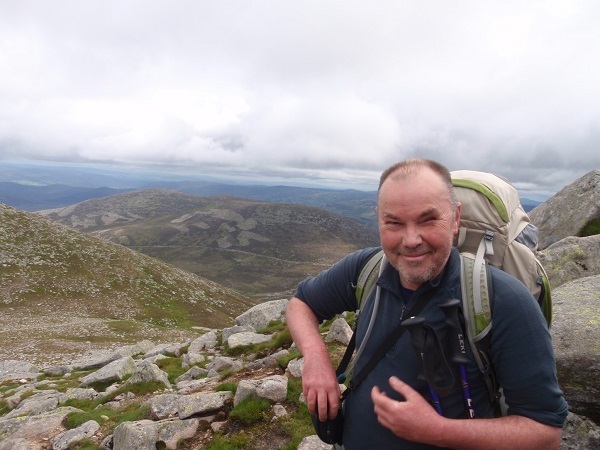 Now, fifteen years later, we decided the best way for us to get walking in these more distant regions of Scotland, was to get ourselves another small tent …..and hope we were still agile enough to get in and out of it! Several weeks ago we went up to the large Tiso in Glasgow and bought ourselves a small light weight Vango tent…..and on Sunday afternoon did the drive up to Ballater and pitched it for the first time. It’s a great little tent and most importantly for me, very easy to pitch. We’d chosen the easy option for the first outing and had booked a couple of nights at the Ballater caravan and camping site…..and it proved a very good choice. Although quite busy it was also quiet and had excellent facilities including a washroom, toilet and shower for disabled visitors. 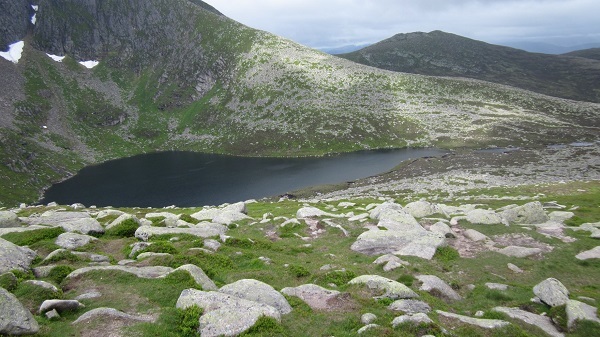 This might sound daft as my sole reason for being there was to try and get to the summit of Lochnagar, but when you’re visually impaired it’s often the simpler things that cause problems …like finding your way around public conveniences, camp site shower blocks etc. Suffice to say, I used the disabled facilities and it made my stay there so much easier. …. I would strongly recommend this site. Anyway, on to the walk itself. We’d got up first thing and driven the 10 miles to the start point in Glen Muick where there is a good car park, toilets and the Balmoral Estate Visitor Centre. We arrived just before 08.00 and eating a quick breakfast headed off up the main path. Low cloud shrouded the hills and although it had been raining when we first arrived, this had stopped by the time we were walking and we were pleased to see the clouds rising and breaking as we gained height. 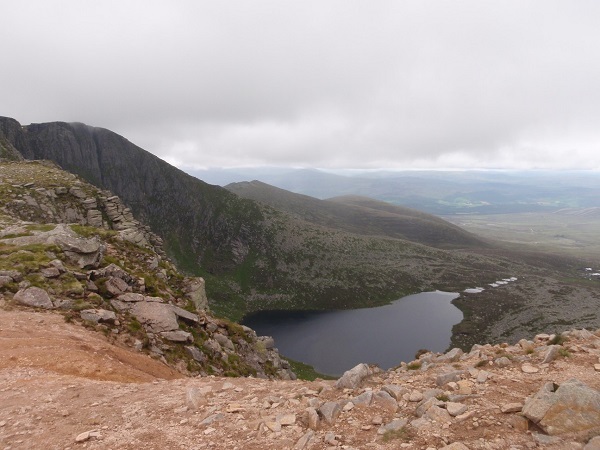 The path led up to the beallach between the main bulk of Lochnagar and Meikle Pap and this overlooks the great NE facing corrie of Lochnagar. As we reached this point the cloud finally lifted off of the summit and a bright patch of sunshine lit up half of the corrie. This really is a fine view point with the huge cliffs dropping into the corrie and its beautiful small dark loch. We stood for a good time just taking the scene in…..and thinking of potential paintings. The rocks seemed to drop in vertical bands with several big gullies obvious and lower down there were several large chevron shaped patches of snow…..what a great hill ….what a great mountain. 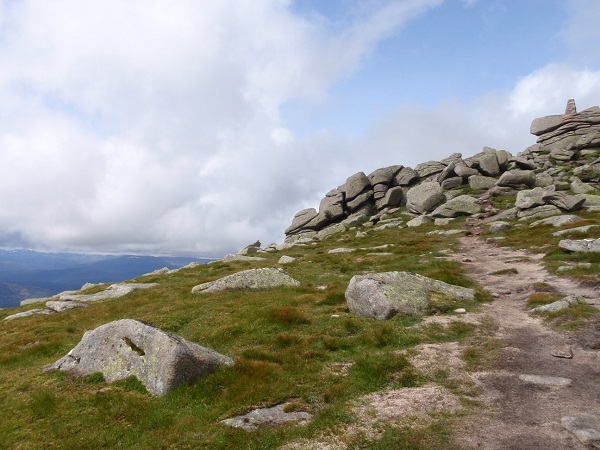 From this point, the path led up steeply through boulders of all sizes and shapes. Being a very popular hill, the path makers had been busy and done an excellent job of creating a winding staircase up onto the plateau at around 1070 m. From this point on it was just a pleasant walk around the rim of the corrie to the summit at 1155m. 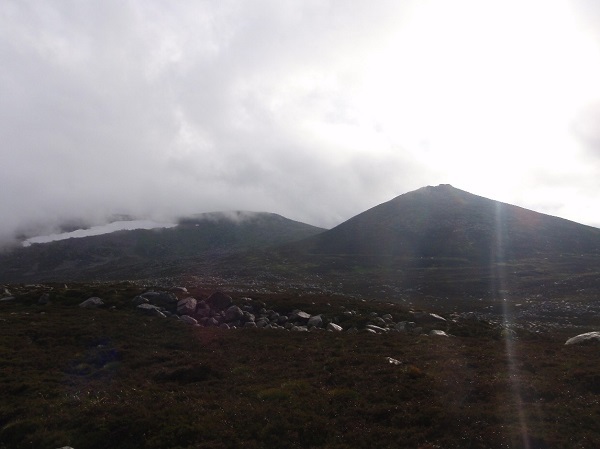 The views didn’t last all the time as clouds rolled in on a couple of occasions, but thankfully lifted again as we approached the small cone of crags that marks the summit ….and we arrived in bright warm sunshine. The views were even bigger from here and mile after mile of Scotland lay all around us, a wonderful patchwork of colour, line and texture. Not really fancying the descent back through the steep boulders, we decided to follow another path down, although this led eventually to a steep section by the side of waterfalls and when we reached this I decided it was going to be very difficult for me to get down safely ….especially as by this time it had become very dark and was raining heavily. We retraced our steps a half kilometre to where another path led back around the side of the hill and eventually back to our outward route ….but avoiding the steep boulders! This did add an hour or so onto our walk but when you can’t see too much it’s better to adapt your route and take a little longer than to risk having an accident. As it turned out, we got some great views later as the rain and low cloud once again broke and lifted off of the higher ground. 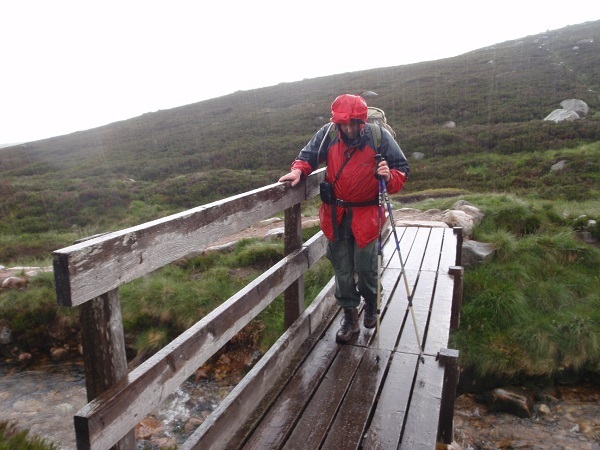 The one big problem though, was that we got back to Ballater too late for a pub meal ….and had to make do with a couple of pints of ‘Trade Winds’ and a packet of crisps for our evening meal…..what a hardship! What a day!